Boil peeled potatoes, when they are cooked, dry and mash it. After potatoes are no more warm mix with organic flour and knead non too much because potatoes are moist and they might sticky too much the dough. Made little stripes and cut it in 1-1 and 1/2 lenght each for made gnocchi. Sprinkle with semolina flour and dry it in a wet place for at least 1 day. 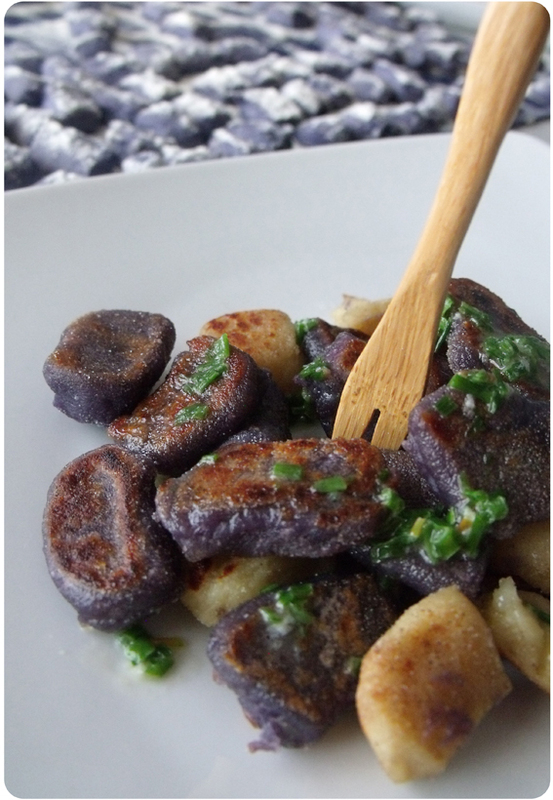 Cook purple gnocchi in a hot pan with a spoon of butter and move continuosly for cook every side. What do you think about my recipe? searched for a long period the purple potatoes, very rare there in Italy. A friend of mine (@ValeDagata) helped me in my mission!! My violette potatoes come from France and also my cat was happy, the packaging became his new bed! 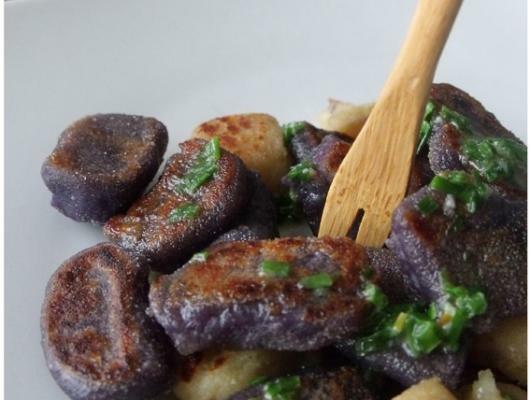 How you can see, I prepared both version traditional gnocchi with floury potatoes and purple version, to make a very fancy dish! I dress this gnocchi with a very tasty butter sauce that i tasted this winter in London with lobster, then I found very versatile in different recipes.